Space-travelers face a topsy-turvy world where up and down is nowhere to be found. Sensors in your inner ear signal to the brain not only that you're not in Kansas anymore but the familiar tug of Earth's one-gravity is missing. Very few astronauts have what's called the "lead head"--immune from space adaptation syndrome or space sickness. Vertigo, nausea, headaches, and in some cases vomiting can strike a new arrival to space. Treatment with medications during the early flight days of a space mission is common, though NASA continues to search for the best way to counter the space sickness. Everything from drugs to yoga and biofeedback remain on the table. Moreover, the up-and-going world of commercial space tourism will likely spotlight the need for some space sickness countermeasures to be "market ready." "We still don't understand the underlying physiology," explained Charles Oman, Director of the Man Vehicle Laboratory in the Massachusetts Institute of Technology's (MIT) Department of Aeronautics and Astronautics in Cambridge, Massachusetts. "It's a tough problem," he said, "a scaled-down version of the problem we face with the NASA astronauts." Oman said that it's appropriate for suborbital or orbital tourists to spend days or weeks in training, depending on the complexity of what they are doing. Like NASA astronauts, educating the public space traveler to space sickness issues is basic. "It's making them knowledgeable about how to avoid general sensory motor problems with weightlessness. It's not just motion sickness. 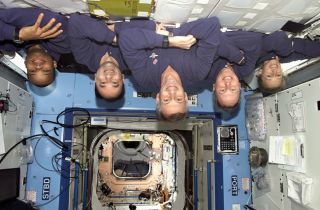 It is also disorientation," Oman told SPACE.com. Oman is an expert in the field, with several of his space experiments flown in the past. Three-quarters of the astronaut community is likely to be susceptible to space sickness, he said. Getting a handle on what's behind space sickness has not been easy. For one, astronauts in the past didn't like notifying ground control that they were busy wiping their bravado off the spacecraft walls. There was paranoia that reporting less than top-notch well-being might spoil an astronaut's chance of another hop into space. In fact, in some cases, the Apollo astronauts encountered what was once billed as the flu. They actually suffered from motion sickness, Oman said. Furthermore, five out of the nine crewmembers that lived on the Skylab space station in the early 1970s suffered from bouts of space sickness. "We learned very early in the shuttle program that it's not just being in weightlessness and making head movements. It was getting up and moving around that was really a significant stimulus," Oman said. Experienced crewmembers tend to reduce their head movements. They also don't immediately start doing cartwheels in the vehicle, Oman said. Generally, space sickness susceptibility is usually limited, he added, to the first two to four days. Some of the best drugs, like scopolamine, carry with them some risks of either sedation or a blurring of vision, Oman noted. Imagine paying major dollars for a space trip where you fall asleep or wind up with some distorted look at Earth and space. That's definitely a downer. Oman said that he thinks space sickness is motion sickness, but it is overlaid on a bunch of other discomforts that come from being in weightlessness, such as puffy faces, headaches and fluid shifts in the body. "The problem about the unpredictability of space motion sickness has always been a puzzle to many people," Oman said. "The problem, of course, is that we don't measure susceptibility when we go into orbit...we've never done a formal susceptibility experiment after reaching orbit." Space motion sickness projects are funded and underway said Lauren Hammit, a spokesperson for the National Space Biomedical Research Institute (NSBRI) in Houston, Texas. For example, Lakshmi Putcha at nearby NASA Johnson Space Center has been studying intranasal scopolamine. Her project uses bed-rest studies with off-axis vertical rotation to test how specific doses of scopolamine manage motion sickness with the least amount of sleepiness, Hammit said. This in-the-nose formulation of scopolamine, if approved by the U.S. Food and Drug Administration as a marketed drug, could also be of benefit to both civilians traveling by sea and military personnel stationed at sea who encounter sea sickness. Another NSBRI effort is that of Lawrence Young also at MIT, Hammit added. Young is using short-radius centrifugation to develop efficient means of safely adapting astronauts to repeated transitions into and out-of artificial gravity without excessive motion sickness. It is obvious that any pay-per-view space tourist surely wants to be gazing out a window, not eying the inside of a vomit bag. People taking a commercial suborbital trek - rocketing to the edge of space and back--get both an energetic launch and the same view as witnessed by Earth-circling astronauts. However, that up-and-down trajectory yields about four minutes of weightlessness. Nevertheless, even at short duration, the feel of microgravity mirrors that experienced by a person adrift on orbit. "Then you get an even more energetic and more interesting reentry," said Burt Rutan, head of Scaled Composites and chief designer of SpaceShipOne, now busy at work on crafting a commercial suborbital spaceliner. "And you get it all done before most of you get sick and vomit," he recently told a student gathering. Progress is being made in dealing with the microgravity malady, said Peter Diamandis, chairman and chief executive officer of the Zero Gravity Corporation (ZERO-G)--a privately held space entertainment and tourism company headquartered in Dania Beach, Florida. For Diamandis consumer weightlessness is a high-flying business. ZERO-G uses a specially modified Boeing 727-200 aircraft. The plane maneuvers in the air somewhat like a roller coaster, with dives and pullouts repeated numbers of times. Passengers inside the aircraft--aptly named "G-Force One"--undergo weightlessness, a type of "free fall" feeling that sky divers experience but without the wind blast in your face. "We've had tremendous success getting the incidence of motion sickness down to one out of 27 people on a typical flight," Diamandis told SPACE.com. "We've done that through a variety of ways including pre-flight preparation, changing our flight profile and very importantly the body position of the flyers during the 1.8 g pullout," he said. Diamandis said that about 25 percent of his clients decide to take medication. "We offer them a chance to get a prescription of Scopolamine and Caffeine, a less potent version of the Scopolamine and Dexedrine that NASA gives their folks." "Space sickness can be easily managed...I'm not particularly worried," said Eric Anderson, president and chief executive officer of Space Adventures, headquartered in Arlington, Virginia. His company organized the orbital travels of Dennis Tito, Mark Shuttleworth--as well as last month's sojourn of Greg Olsen--to the International Space Station via Russian Soyuz flights. Anderson has co-authored a newly published space travel guide: The Space Tourist's Handbook (Quirk Books, November 2005), along with Joshua Piven. In the book, space sickness is touched upon, along with ways to "ease the quease" spelled out. "I don't think space tourism, suborbital or orbital, is going to suffer from people thinking that it's automatic that you're going to get up there and be sick," Anderson told SPACE.com. But being a "customer-focused" space travel provider, Anderson said his company is resolute on providing their patrons enjoyable space experiences. Having vehicles that don't make space tourists sick is an important factor, he said. "So that's a competitive advantage for [spaceship] developers to balance against...things like letting people float weightless and seeing the Earth. It's all sort of tradeoffs. But not getting sick is a pretty big one."